With the hasty and impetuous lifestyle of today’s modern world, there is a dire to relax and rejuvenate your mind, body and soul! And yoga is the only way to achieve that. The age-old practice of yoga bestows participants with numerous benefits that range from better temperament, increased flexibility, and better respiratory, vitality & energy to improved athletic performance, better digestion and balanced metabolism. Today, a lot of countries are drawn towards this ancient practice to maintain a good balance of the mind, body and soul. Be it Indonesia, Thailand, Mexico, Costa Rica, Spain or the USA, you can find a number of scenic yoga destinations around the world. But not to forget India – the land where this ancient practice of spirituality started! Traces its history from ancient India, yoga has become an integral part of India’s rich culture. This spiritual retreats of Kerala, Goa and Rishikesh play a significant role in pioneering the wellness tourism of India. Every year, in the month of March, international travellers from across the globe (especially from the western world) come to India to be a part of one of the largest public gatherings of the world – International Yoga Festival in Rishikesh. By the name, it clearly suggests what the festival is all about! But still, what else do you know about this mass celebration or for what it is celebrated? Well, if you have no idea about all that then hang on till the end as this travel guide to the International Yoga Festival in Rishikesh will give you all the insiders and insights of it. So, keep scrolling! It’s always very important to know history first before gathering all the other useful information about a particular thing! So, let’s know about some history of yoga. It is believed that yoga dates back to the time of Indus Valley Civilization. The science of yoga states that it was first practiced much before the start of religious and belief system. As per the yogic lore, Lord Shiva was the first yogi (a person who practiced yoga) or Adiyogi. However, the origin of Yoga is still a topic of debate. The long prevailing history of this ancient spiritual discipline is divided into four main periods – Pre-Classical, Classical, Post-Classical and Modern. Let’s have a look at what history of each period says. Pre-Classical Yoga: Some 5000 years ago, it was Indus-Sarasvati Civilization that first developed yoga in the northern region of the country. The term ‘Yoga’ was stated in the ancient sacred scripture – the Rig Veda. During that time, the practice of yoga was slowly refined by the Rishis and Brahmans. They subsequently noted their beliefs and practices in Upanishads (ancient Sanskrit texts including the philosophical ideas and concepts of Hinduism). Classical Yoga: Unlike the Pre-Classical period, the classical era brought the systematic presentation of Yoga. It was defined by Patanjali Yoga Sutras. Written in the second century, yoga sutra explains the path of Raja Yoga (classical yoga). Under this text, the practice of yoga was categorized into ‘eight-limbed path’. It includes steps and stages to achieve enlightenment. Even in today’s world, the aspects of Patanjali Yoga are considered as the Father of Yoga, and hence, can still be seen influencing various styles of modern yoga. Post-Classical Yoga: In the Post-Classical era, the yoga masters refused to imply the ancient teaching of yoga and instead created their own system of practices. This is the era when Tantra Yoga was developed to sanctify the mind and body in order to break the knot of binding one to its physical existence. The practices of the physical-spiritual connection lead to the establishment of yoga in the west which is renowned as Hatha Yoga. Modern Period: The modern period starts from the late 1800s when the yoga masters started travelling to the west to draw the attention of the people and to turn them into followers. Such an incident first happened in the year 1893 when Swami Vivekananda went to Chicago for Parliament of Religions. In his lectures about the universality of the world’s religions and yoga, he stunned everyone. It was T. Krishnamacharya along with Swami Sivananda and few other yogis who later in the 1920s and 1930s promoted Hatha Yoga in India. By 1924, the first Hatha Yoga School was opened in Mysore. Krishnamacharya trained three students with same to continue his legacy and to promote Hatha Yoga. Well, that was a lot of historical knowledge, isn’t it? Now, let’s have a look at the other important details of the popular festival in India. It’s been more 20 years that International Yoga Festival is getting celebrated in Rishikesh. You would be amazed to know that it was the initiative of Uttar Pradesh Tourism to host such an event at a large scale. This was the time when Uttarakhand was not a separate state and was a part of Uttar Pradesh. For the first few years, the festival was celebrated at Hotel Ganga Kinare. During that time, only a few numbers of participants used to be part of this event. Later in the year 1999, the state government (Uttar Pradesh) approached Parmarth Niketan Ashram to be the venue of the festival. This was the year when Rishikesh Yoga Festival got the limelight and became a big hit. However, the festival was observed in the month of February. Although the participant stayed at the hotel, the yoga classes and sessions were observed at Parmarth Ashram. The department of meditation was under the Pujya Swami Veda Bharati Ji whereas Yogasanas were led by Yogacharya Bharat Bhushan Ji along with his team. Such is the growth and the charm of this enticing festival that what started with a few people at a hotel has now become one of the world’s largest gatherings of its type. 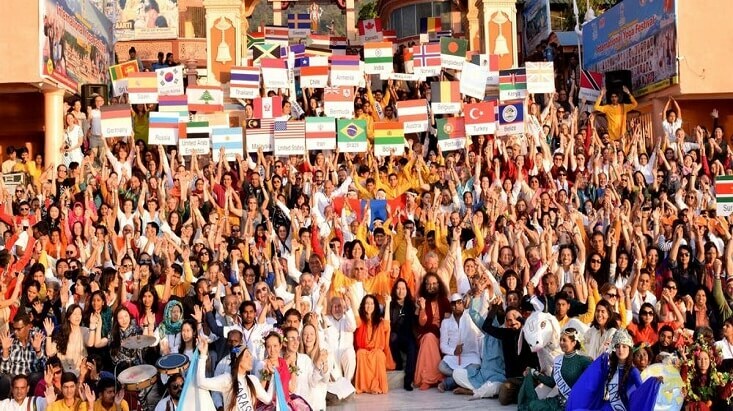 Today, people from more than 30 countries come to be a part of this grand event in order to attain spirituality and a real sense of balance. 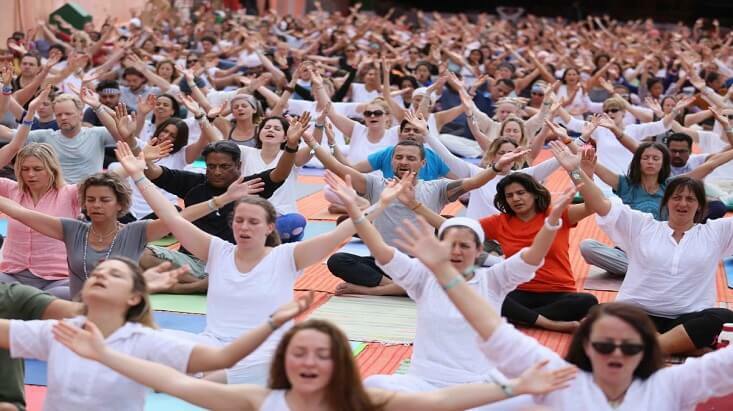 What is International Yoga Festival (IYF)? International Yoga Festival is a one-week long gathering observed in the city of Rishikesh in Uttarakhand. The festival promotes the traditional practice of Yoga under the supervision of proficient yoga masters. Throughout this one week, people get an opportunity to participate in the more than 70 hours of yoga classes and that too from the highly-professional yoga instructors. At the festival, you can expect to learn different styles of yoga including kundalini yoga, kriya yoga, Iyengar yoga and power vinyasa yoga. Rishikesh in Uttarakhand is the place where the International Yoga Festival is celebrated. 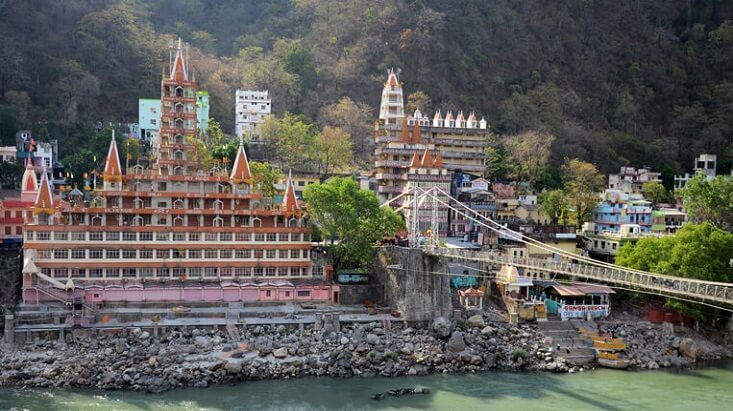 Located on the banks of holy river Ganges, Rishikesh is one of the top yoga retreats in India. Engirdled by the high mountain peaks, blessed with a plethora of natural beauty and soaked in spirituality, Rishikesh is reckoned to be the top places to visit for the best yoga holidays in India. 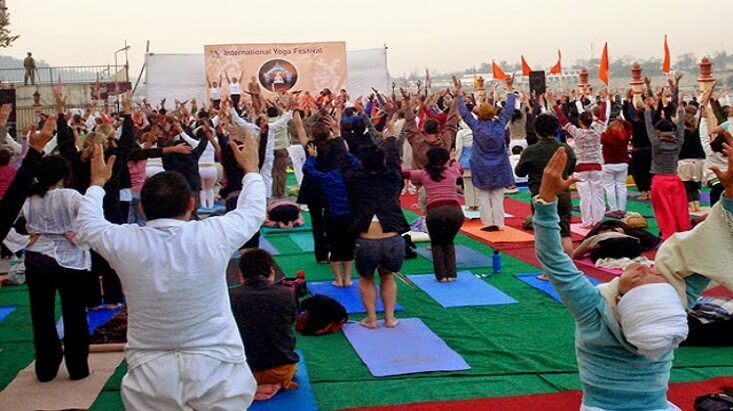 The world yoga festival in Rishikesh is celebrated every year in the month of March. The International Yoga Festival dates for 2019 are from 1st of March to 7th of March. One of the best places to experience yoga – Rishikesh is known to proffer tourists a surreal spiritual experience (throughout the year) through its amazing yoga retreats. This blissful experience gets doubled-up when comes international yoga week in the month of March and the city celebrates the International Yoga Festival. Throughout this time, you will have the opportunity to indulge in a spiritual experience through more than 70 hours of yoga sessions. In these yoga classes, you will get to learn about different yoga asanas from professional yoga instructors or masters. Not just from Indian professional, visitors will also get a chance to learn this ancient practice of attaining a proper balance of your body, mind and soul from masters of global yoga schools and styles. Iyengar Yoga, Kundalini Yoga, Power Vinyasa Yoga and Kriya Yoga are some popular types of yoga that you can expect to practice and learn during this internationally renowned festival. Now, as the name tells you, this wellness festival is not just about hours and hours of yoga sessions. Well, it is about yoga but it also hosts various other events and programs that are key highlights of this entire event. Each of these seven days, you will be also treated with Satsang. In Satsang, spiritual masters and revered saints from round the corner of the world deliver their divine words on various inspiring subjects and topics. Apart from yoga, one of the major highlights of the city of Rishikesh is the evening Ganga Aarti which is also an integral part of this entire fete. Surpassing the boundaries and borders of cultures, languages and castes, Ganga Aarti on the banks of River Ganges is one of the surreal experiences to be a part of while in Rishikesh. The aarti is led by the Pujya Swamiji along with Sadhvi Abhaji and Parmarth Rishikumars. After the Ganga Aarti, the evenings of these seven days are all about Satsang, campfires, cultural performances and much more. You will have the chance to relish the folk and classical music along with dance and dramas. These cultural performances will be observed until 10:00 PM. People also choose to attend the evening Satsang from the spiritual masters and saints. Besides all this, the beautiful Parmarth Niketan is one of the major attraction of this entire yoga event in Rishikesh. On the sacred banks of River Ganga, Parmarth Niketan is an exquisite sightseeing place in Rishikesh which is beautifully adorned with the avalanche of natural beauty, lush greenery and the sacred ambiance. Above all that, the most beautiful aspect of this entire festival is that it hosts numerous family of yogis from around the world. You have all the opportunity to interact with them and to make new friends. Being one of the popular tourist attraction and the best meditation retreats in India, Rishikesh hosts plenty of staying options for tourists. The city is dotted with a good number of standard and deluxe resorts that are masterly capable in proffering basic modern facilities. The city also offers a number of budget options in the form of hotels, homestays and ashrams. However, if your choice of preference for staying is luxury then Parmarth Niketan is one of the best luxurious river retreats in Rishikesh. 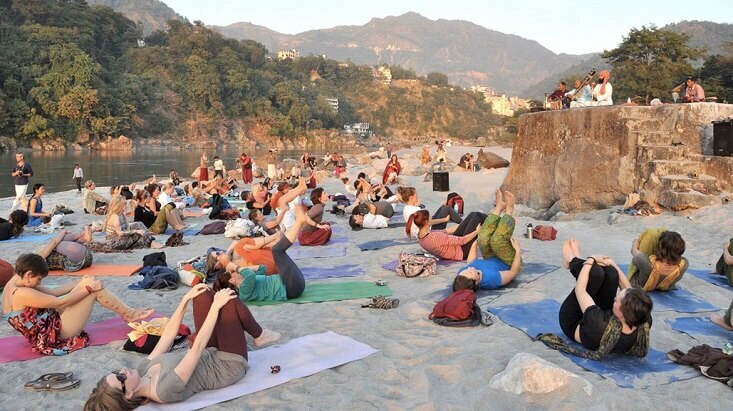 Since the month of March would be a peak time to visit the city mainly because of the Rishikesh yoga festival, there are chances that all the hotels and resorts would be sold out during that time. In that situation, you can opt to stay in Haridwar which is just 19 km from Rishikesh. budget to luxury, the city of Haridwar offers all sort of accommodation options that come in every budget. This gives tourists a choice to book accommodation in Haridwar as well while vacationing in Rishikesh. Reaching Rishikesh is neither a difficult task nor a complicated one. The city is pretty well connected with all the three means of transport; air, rail and road. However, the best way to reach Rishikesh is the railway. By Air: Rishikesh does not have its own airport. The nearest airhead to Rishikesh is in Dehradun which is Jolly Grant Airport. The distance between the airport and Rishikesh is just 20 km which can be covered in an hour drive. The airway is the most ideal way to reach the city for international tourists as well as those who prefer time over money. From the airport, you can board a taxi to reach the destination. By Rail: The city of Rishikesh has its own railway station. However, the station does not boast good connectivity with other major cities. For a better railways connectivity, you can choose Haridwar Junction Railway Station as the nearest railhead to reach Rishikesh. The station is located at a distance of 20 km. From the railway station, you can hire a taxi or can board a bus to reach the destination. By Road: Like rail and air, Rishikesh is also quite well connected with the network of roads and national highways. Buses from neighbouring cities like Delhi, Chandigarh, Karnal, Kurukshetra and Dehradun ply on a regular interval. For many local travellers, boarding a bus is also an ideal way to travel Rishikesh. However, you can also choose to travel by your own vehicle from these cities. What to See in and around Rishikesh? While planning a tour to Rishikesh Yoga Festival, make sure your vacation shouldn’t restrict to that only. There is a lot more to explore and experience in the city making a sightseeing tour in Rishikesh a must. From nature to spirituality to culture to adventure, the city of Rishikesh is one of those tourist destinations in India that are ideal for people of all ages. Let’s have a look at the tourist places in and around the city which you can explore while visiting Rishikesh. Lakshman Jhula: Built over the river Ganga, Lakshman Jhula is an iron suspension bridge and a popular tourist landmark in Rishikesh. With the length of 450 feet, the bridge provides a link between the districts of Pauri and Tehri. From the bridge, one can relish the surreal views of the entire city. Here, people can be seen spending hours savouring the beauty of the place. Jumpin Heights: For all the adventure buffs, Jumpin Heights is situated at a distance of some 25 km from Rishikesh in Mohan Chatti. The place is famous amongst adventure seekers as it proffers an opportunity to indulge in various adventure activities like Zip Line, Bungee Jumping and Giant Swing. Not just this, Jumpin Heights is known for housing Asia’s longest flying fox with a distance of 1 km. Talking about adventure, river rafting (not to forget) is undoubtedly one of the best adventurous things to do in Rishikesh. Neelkanth Mahadev Temple: Located at a distance of around 29 km from the city, Neelkanth Mahadev Temple is one of the highly revered sacred sites around Rishikesh. The temple boasts a scenic setting as it lies comfortably on a hilltop. Sacred to Lord Shiva, Neelkanth Mahadev Temple remains flocked with devotees throughout the year. However, on the day of Maha Shivaratri, the crowd gets doubled up. From the temple, one can also get to savour the exotic views of the surrounding. Ram Jhula: Like Lakshman Jhula, Ram Jhula is another significant tourist landmark in Rishikesh. With the length of 450 feet, the bridge connects Swarg Ashram and Sivananda Ashram with each other. Ram Jhula is the gateway to numerous attractions in Rishikesh like Beatles Ashrams, Yog Niketan, Geeta Bhawan, Parmarth Niketan, Swarg Ashram and Sivananda Ashram. Triveni Ghat: Another sacred site in Rishikesh is Triveni Ghat. Renowned for the Ganga Aarti, Triveni Ghat is one of the highly revered and most popular tourist landmarks in the city. The term Triveni stands for two words where ‘Tri’ means Three and Veni means confluence, whereas the Ghat refers to the banks of the river. The place is mainly known for the Ganga Aarti which happened every day. Rishikund: Rishikund is a sacred pond located near the temple of Raghunath in Rishikesh. Believed to be built by Kubz saint, Rishikund is sacred to Goddess Yamuna as the water of the pond is said to be of Yamuna River. One of the major highlights about this place is that the water of the pond reflects the image of the Raghunath Temple. Being one of the most sublime places in the city, Rishikund is an ideal spot to spend a day outing with friends and family. Bharat Mandir: Another ancient Hindu shrine in Rishikesh is Bharat Mandir. Dedicated to Lord Hrishikesh Narayan, the temple is located in the downtown of the city. On the day of Basant Panchami in 789 A.D, the Hindu saint Jagadguru Adi Shankaracharya reinstalled the image of presiding deity in the shrine. Today, on Basant Panchami, a symbolic procedure of reinstallation is observed in the temple. The temple is also known for trees that are believed to be thousands of years old. The pipal, vat vriksh and bail tree boast an important significance in the Hindu mythology, and hence, are also worshipped by the devotees. Do you want to get rejuvenate? Or just want to detoxify yourself from the glitz and glamour of the outside world? If yes, then the International Yoga Festival is the perfect place to be. And if you’ve already made up your mind to be at this popular spiritual festival then all you need now is a good travel package. Being one of the leading tour operators in India, we proffer meticulously designed International Yoga Festival tour packages and that too at best prices. Our Rishikesh yoga travel packages not just includes a great holiday time but great hospitality and impeccable services as well. Besides, we also have the option of customizing your Rishikesh holiday package for those who wish to explore the city after the festival. To know more, you can fill enquiry form or call us at +91- 8744012051.